The State Auditor’s Office is responsible for examining the financial affairs of all local governments in the state. We conduct more than 2,000 audits of local governments each year. Using the results of those audits, our Office then evaluates the overall patterns and that were reported. The audit exception that has been identified most frequently in the past several years is a lack of internal controls over accounting and financial reporting. To help local governments improve their accounting and financial reporting, the Auditor’s Office is providing some new tools. 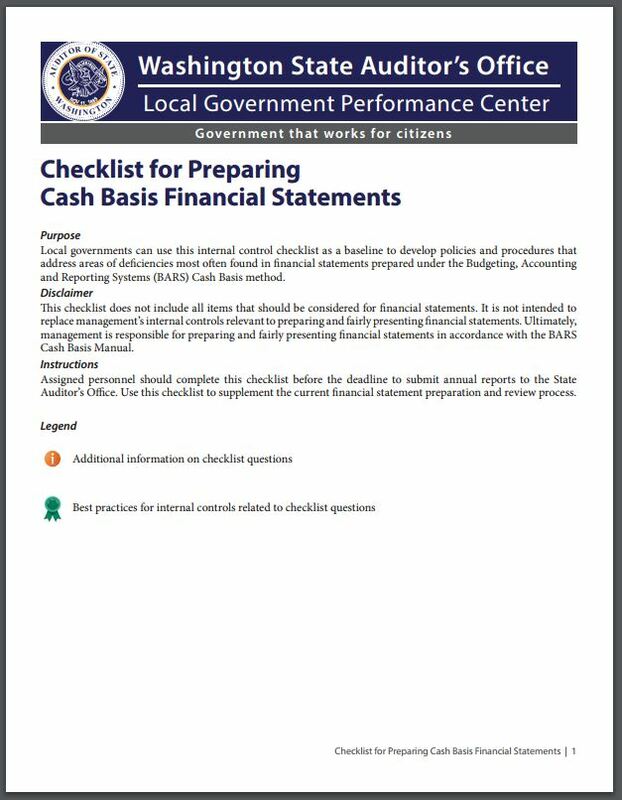 For those reporting BARS cash basis financial statements, we have a new Checklist for Preparing Cash Basis Financial Statements. For local governments that report under generally accepted accounting principles (GAAP), we are developing a tip sheet, coming soon, that can be used when preparing financial statements. These resources do not include all items that should be considered when preparing financial statements. They are not intended to replace management internal controls that are currently in place to prepare and fairly present financial statements. Timely and accurate monthly bank reconciliations are performed for all bank accounts. Financial activity is accurately reflected in the accounting records. An effective review of the financial statements is performed to ensure amounts reported agree with underlying accounting records. Annual financial reports comply with the current Budgeting, Accounting and Reporting Systems (BARS) Manual. Annual financial reports are submitted in a timely manner, in accordance with state law. These tools offer information about best practices and provide additional guidance for government staff as they prepare financial statements. Be sure to check out the checklist, test it out and send your feedback or suggestions to performance@sao.wa.gov. We want to hear from you.